I'm bumping this thread up. Agreed. I've had this house in my Redfin favorites, wondering when it would sell. I have no idea of prices in Virginia but I guess a small, "odd," one bedroom house is a tough sell. The fools. From what I have been told, the buyer is preservation minded. Good! Yes! The quirky little Burcher House designed by Ling Po, lead architected, WWP, is in good hands and will be well loved. It is my understanding that everyone that viewed the property said they would level the home. Fortunately, Mr Burcher wouldn’t have that. The house would remain or he wouldn’t sell. I rolled the dice with this letter and an offer and I closed 12 February. I’m nothing less than honored to own this home. I remember ten years ago, driving ALL around Poquoson trying to familiarize myself with the area and looking at homes as our family was getting ready to make a move from Hampton. I vividly remember spying this low roofed, little red home tucked away in the woods and thought, man! I’d love to see that place!! I never thought the day would come where I would actually get to walk the property, learn it’s history or get to meet you. I knew the minute I drove up to the property, without setting foot inside, I was smitten. I was taken by the simple lines of the architecture and how the structure seemed to be wrapped in a ribbon of glass. Upon entering your home, there, I fell in love. Again, the simplicity of the home, the airy feel, the fact that one can sit in the built-in couch and the window placement be at the perfect eye level to view the water...it’s perfect, really. Additionally, it was obvious that the home, your home, had been lovingly cared for over the years. After I saw your home, I had to meet the gentleman who built such a special place. I appreciate you taking time out of your day and chatting with me when I came to visit you. I was honored to hear the story of how the home came to be, how you reached out to Mr Wright and found someone willing to design a home for you, a home that fit seamlessly into its setting and how you tenaciously searched for a builder who would build the home to design specifications. Truly, I was honored that you shared all of that with me, a complete stranger. Your home is special, Mr Burcher. It is, in my opinion, a one of a kind piece of art, really, and it deserves to be loved and appreciated for many more years to come. I’d like to be the caretaker of your home going forward. If I am able to purchase your home, I promise it will stay just as it is and will remain standing as a little piece of history within Poquoson. Were a compendium of such letters to be published, yours would be among the best. Also, I'd buy that book. Now I'm picturing Mr. Burcher's smile upon reading your missive. Many thanks for sharing your heartfelt letter to Mr. Burcher, and for stepping up to be the next steward of this fine little house. You note that Mr. Burcher reached out to Mr. Wright...did he approach Taliesin prior to Wright’s death in 1959? 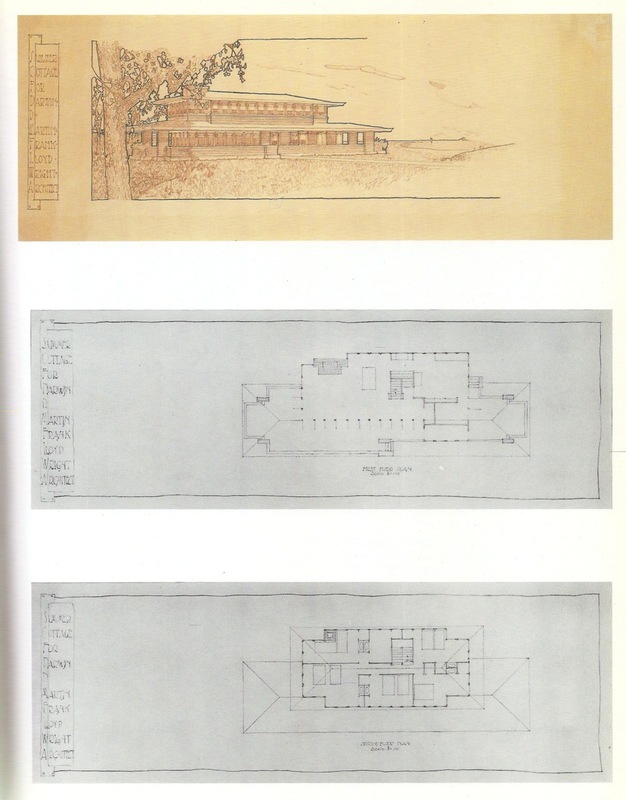 I know of a house built in Exton PA in which the original owner approached Wright, met with him in early 1959, but no design work had begun prior to Wright’s passing in April, 1959. The Exton house was taken up by Wright associate John Howe, and completed by Taliesin Associated Architects in the early 1960’s. Could this be a similar situation, but with the project being carried out by Ling Po? though for the exterior, the Carlson, Fuller, or Penfield houses and the Wyoming Valley School might serve as precursors. To see the "skeleton" of a bungalow or summer house, one could go all the way back to c. 1908 and the "Summer Cottage for Darwin D Martin," perhaps . . .
Reference Mr Burcher reaching out to Mr Wright...that was an error on my part. I’m not certain as I only had the one conversation with the gentleman but, city records show he purchased the plot of land in 1964 and the home was built in 1968. So, to my knowledge, Mr Burcher reached out to the Wright team of folks and not Mr Wright himself. Now that the sale is final and a bit of time has passed, I’ll stop in to visit Mr Burcher again and get some clarification and hopefully copies, at the very least, of his initial correspondences requesting the build. Thank you all for all of your kind words and insights on my home.